It’s a treat to be in the south of Sweden this weekend. Today, the annual LitteraLund Festival for children and young people starts in Lund, this year as a Pre-Festival before the big event in April next year. A conference about children’s and young adult literature is on the agenda for today. One of the participants is Mika Larsson, who will talk about the work of one of the ALMA nominees for next year, the organisation All of Poland Reads to Kids Foundation. They are celebrating their 10th anniversary this year, and Mika Larsson will describe a unique commitment that laid the foundation for a modern children’s culture in Poland. Tomorrow, LitteraLund’s arranging a public program for children at the Lund City Library. On Sunday, Astrid Lindgren’s Näs in Vimmerby (the birthplace of Astrid Lindgren) are celebrating the book with a program featuring Swedish authors such as Håkan Nesser, Marie Hermansson and Helena von Zweigbergk. More books for young people adapted to film? In the wake of the Harry Potter movies, there seems to be an increase of getting books for young people to be adapted for screen these days, according to Swedish newspaper Metro. Suzanne Collins’ The Hunger Games will premiere in March next year, in Sweden, along with The mortal ­instruments by Cassandra Clare. More books for young people to be film is Beautiful creatures by Kami Garcia and Margaret Stohls , together with Maximum ride: Angel experiment by James Pattersson. 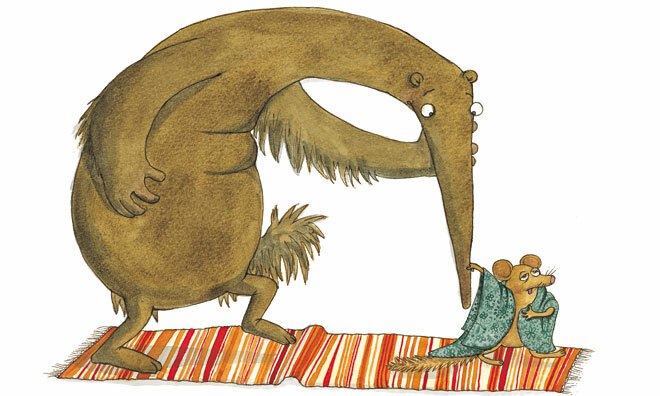 Successful screen versions that we can recommend is, of course, this year’s ALMA recipient Shaun Tan’s Lost Thing, and Spike Jonze’s film adaption of 2003 ALMA recipient Maurice Sendak’s Where the Wild Things Are. Astrid Lindgren’s most beloved character Pippi Longstocking is certainly still going strong, and we simply must put forward some examples on how the next generation could experience the world’s strongest girl. In the summer of 2012 Nintendo DS fans all over the world will be able to buy a game featuring Pippi and her world of adventures and friends. It´s set to be an adventure game filled with activities, features and mini games for children in the ages of 4 to 10 years old. It will give players a true Pippi experience with all of the characters and environments made famous by the books and movies. Just the other week a special edition of Pippi Lockstocking (featuring five comics) was part of Happy Meal at McDonalds in Sweden, as a result of a co-operation with Läsrörelsen (a Swedish reading organisation). 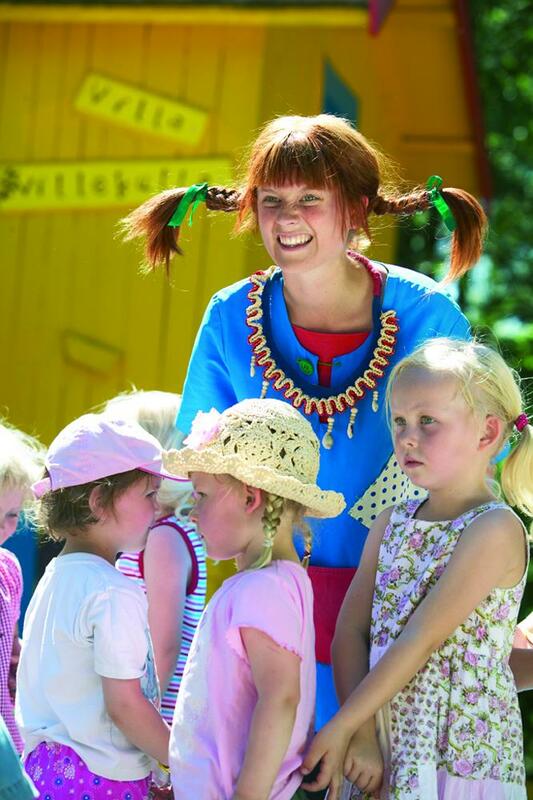 And when it comes to other Pippi adventures in real life, there have been an extraordinary year for Astrid Lindgren’s World (ALV) in Vimmerby. At this theatre and theme park visitors actually can experience characters from Astrid Lindgren’s books in their true settings, and of course Pippi is one of the main characters. Having won the Nordic Region’s Best Theme Park in March and the 2Entertain’s Upplevelsepris 2011 (Experience Award) in May, ALV also presented a new visitor record during the summer season. This week ALV became two-time winner when the Swedish web prize was presented. And yesterday ALV was announced as winner of the prestigious international prize “Trip Global Award” for best tourist experience in Sweden. What a year!! The words are coming from Michael Rosen, one of the 2012 nominees for the Astrid Lindgren Memorial Award, in an article published in the Guardian on October 18th. – This means that the jury’s work becomes much more difficult but also very much more exciting. 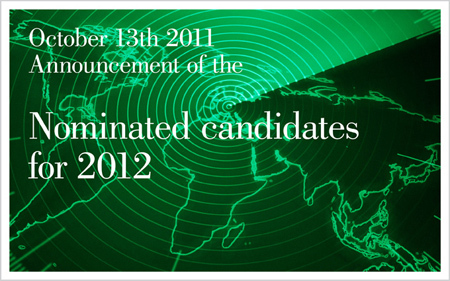 Do the candidates for 2012 in any way differ from the previous nominees? – This year we have storytellers which we´ve not had before. Up to this date, the award has not been given to any storyteller but authors, illustrators and organisations active in reading promotion. What does this storytelling trend represent? – We are very book-oriented in Western Europe, while the storytelling tradition has been very widespread historically in Western Europe and especially in other parts of the world. Now, these candidates come forward. We must show respect and listen to the stories and consider how they stand in relation to the other award categories. – On the whole, I think one wants to draw attention to storytelling. We must listen to each other. We must listen to each other’s stories. It’s a way to get to know each other and it’s a way of understanding the world. So for me, the oral storytelling is as exciting as the written stories. The whole interview is available (in Swedish) here. Illustration by Maria Nilsson Thore from Lotta Olsson’s “Konstiga djur”. The prize winners will be announced on November 21st. The August statuette by artist Mikael Fare. Congratulations to all the winners of the Deutscher Jugendliteraturpreis 2011! The winners of this year’s Deutscher Jugendliteraturpreis (the German Children’s Literature Award) were announced yesterday at the Frankfurt Book Fair during the award ceremony. The Arbetskreis für Jugendliteratur is responsible for awarding the prize, which is Germany’s only state-sponsored prize for works of fiction. It has been awarded annually since 1956 by a jury of literature specialists and critics in four categories: picture books, children’s books, young adult books and non-fiction. In addition, a special annual award for lifetime achievement is given alternately to a German author, German illustrator or German translator. Also, since 2003, an independent young adult jury gives its own award. Please find all the winners and the jury citations at the award website here. 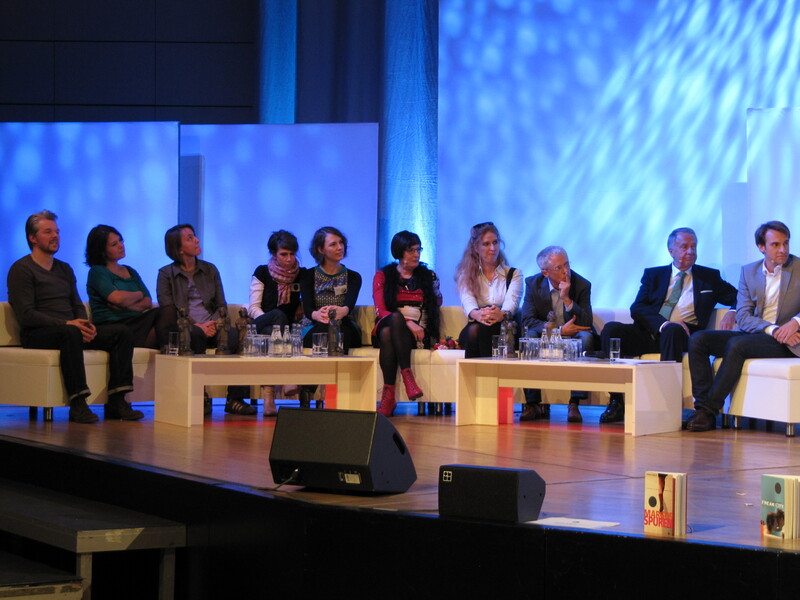 All the winners of Deutscher Jugendliteraturpreis 2011, with Chairman of the Jury Dr. Susanne Helene Becker (center), Federal Government Commissioner for Culture and the Media Bernd Neumann (second right) and moderator Marc Langebeck (right). 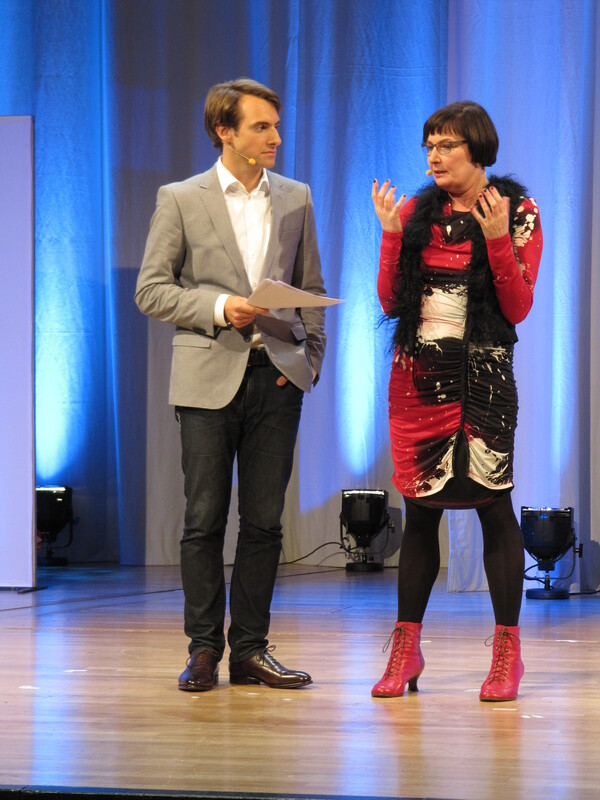 Moderator Marc Langebeck with Chairman of the Jury Dr. Susanne Helene Becker. 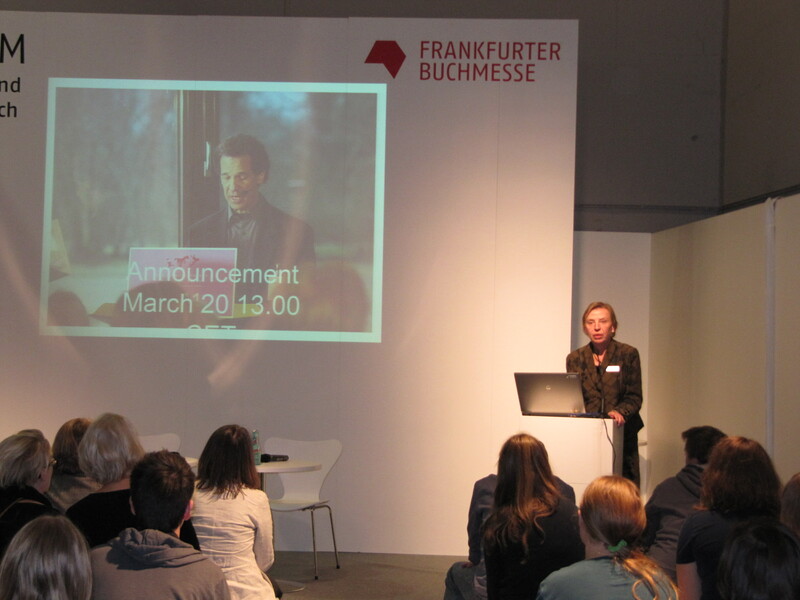 To mark the announcement of the list of nominees for the 2012 Astrid Lindgren Memorial Award, the Frankfurt Book Fair and the Astrid Lindgren Memorial Award held a program yesterday at the fair. 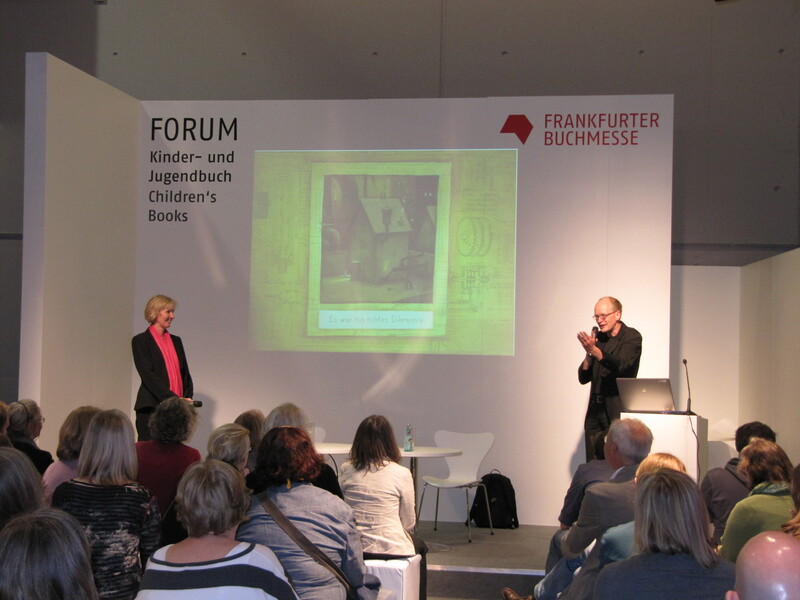 The audience was welcomed by Gabi Rauch-Kneer, vice president of the Frankfurt Book Fair, followed by a short presentation of the award by soon-to-be director of the Astrid Lindgren Memorial Award, Helen Sigeland. The audience was then treated to a presentation of the works and world of Shaun Tan, in the form of a conversation between Andreas Platthaus from the Frankfurter Allgemeine Zeitung and Dr. Christiane Raabe, International Youth Library. Andreas Platthaus pointed out how Shaun Tan always has a vision in his work that he follows and never departs from, and Christiane Raabe talked of Shaun Tan’s ability to put his readers in a certain mood, without having to use words. The audience listened as they discussed a number of Shaun Tan’s books, including The Rabbits (1998), The Arrival (2006) and Tales from Outer Suburbia (2008). Andreas Platthaus in conversation with Dr. Christiane Raabe. 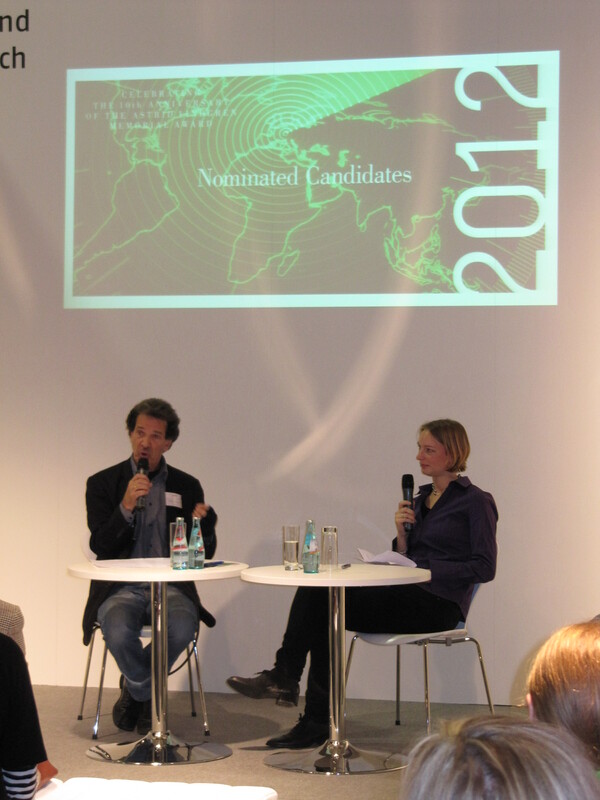 Larry Lempert, Chairman of the Jury, then presented the list of nominees for the 2012 award, in a talk with Gesa Füßle. He spoke of the nomination process and of the task of every year starting over with a list of an ever-increasing number of nominees from all over the world. He describes how, by methodically evaluating each candidate, this work eventually leads to the jury being able to announce a recipient each year. Larry Lempert also spoke of the pride he feels every year when announcing the winner, knowing that the prize contributes to reading promotion and raising the awareness of children’s literature all over the world. Following the program there was a reception as the list of candidates was passed out to the audience. Former Director of award office Erik Titusson with Helen Sigeland. 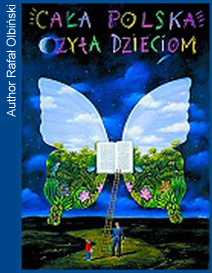 184 candidates from 66 countries are nominated for the world’s largest award for children’s and young adult literature. This was revealed today at the Frankfurt Book Fair by Larry Lempert, Chairman of the Astrid Lindgren Memorial Award jury. The figures show a distinct increase compared to last year. – It’s very gratifying that the number of nominated candidates and countries represented continue to increase, says Larry Lempert. The jury is full of enthusiasm for the exciting and difficult task to consider the work of so many qualified candidates. Among the nominees are 38 per cent authors, 21 per cent illustrators, 20 per cent promoters of reading and organisations, and one per cent oral storytellers. 20 per cent of the candidates are nominated in more than one category. Among the candidates are 81 men, 74 women and 29 organisations and projects dedicated to promotion of reading. The nomination list has eight new countries represented compared to last year: Cyprus, Ecuador, Eritrea, Greenland, Moldova, Mongolia, Tanzania and Zambia. 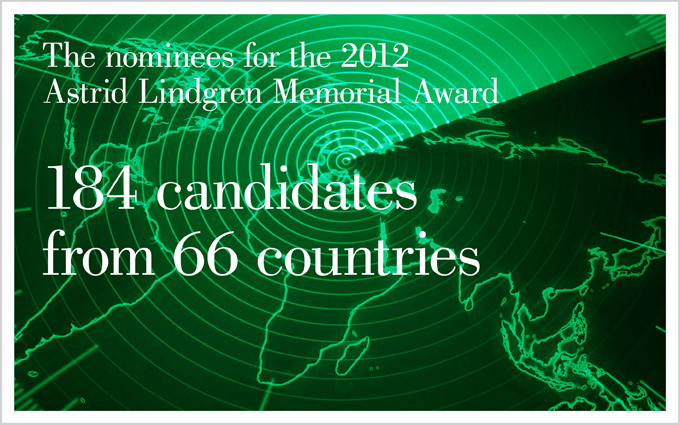 A complete list of nominees is published on www.alma.se/en. The recipient or recipients of the Astrid Lindgren Memorial Award 2012 will be announced on March 20th 1:00 p.m. CET in Vimmerby, the birthplace of Astrid Lindgren, and online at www.alma.se/en. 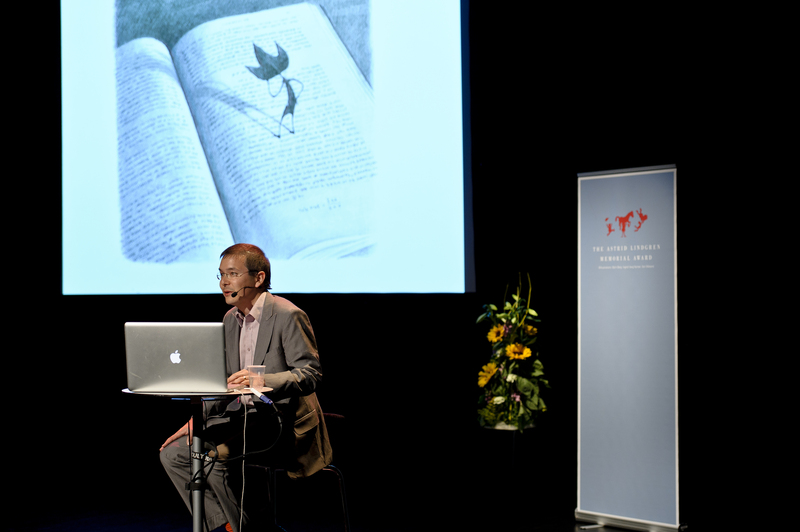 In 2012 the Astrid Lindgren Memorial Award will be presented for the 10th time. 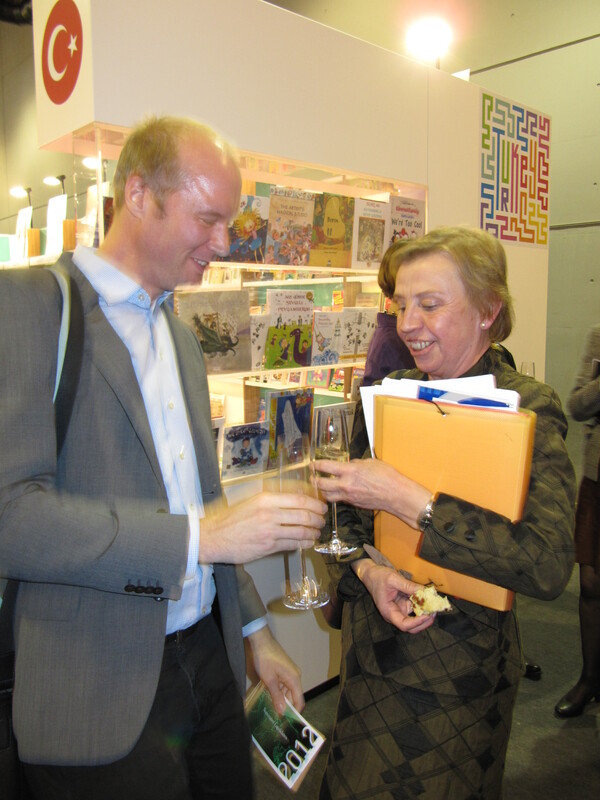 The nominated candidates for 2012 Astrid Lindgren Memorial Award will be revealed in two days, on Thursday October 13th at the Frankfurt Book Fair. In collaboration with the Frankfurt Book Fair, a presentation of this year´s recipient Shaun Tan will be held in the Swedish Arts Council‘s stand (Forum Children’s Books, Hall 3, stand no K399). Ralf Keiser, Carlsen Verlag and Dr. Christiane Raabe, International Youth Library, will participate along with journalist Andreas Platthaus from the Frankfurter Allgemeine Zeitung, who will lead the discussion. Shaun Tan's award lecture, House of Culture in Stockholm, May 2011. Photo: Stefan Tell. 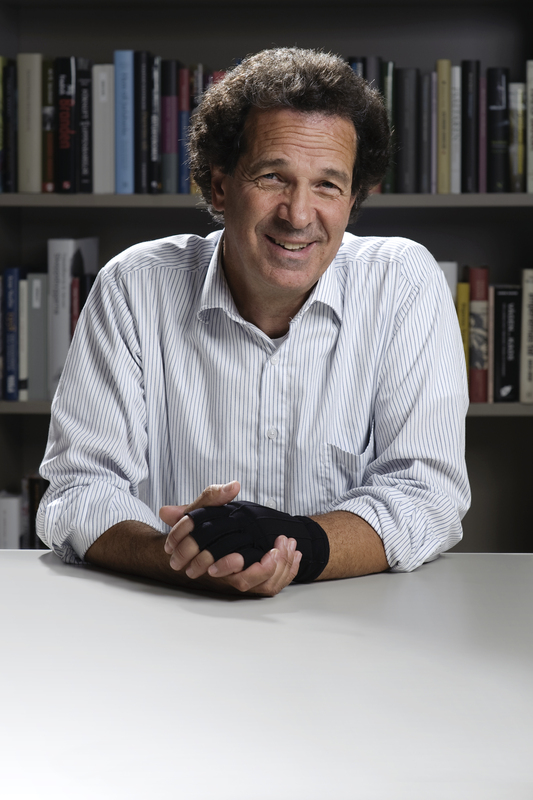 Larry Lempert, Chairman of the Astrid Lindgren Memorial Award jury, will reveal the nominated candidates at 5:10 p.m. whereupon he´ll have a public talk with Gesa Füssle, M.es L.
Larry Lempert, Chairman of the Astrid Lindgren Memorial Award jury. Photo: Stefan Tell.